Out in the open, he started directing air support on the Taliban positions firing on his team with machine guns, rocket propelled grenades and sniper rifles. Christopher Baradat is how you might imagine an ideal war hero to be: humble, soft-spoken, self-effacing, quick to point out the heroism of others before himself. But nobody else did what the former Air Force staff sergeant did one April day in 2013: Stand unwilting under enemy fire for three hours to help rescue a squad of his fellow soldiers pinned down by the Taliban in a death trap of a valley in Afghanistan. For his “extraordinary heroism,” the 28-year-old Novato resident was awarded the Air Force Cross, the service’s highest decoration for valor. 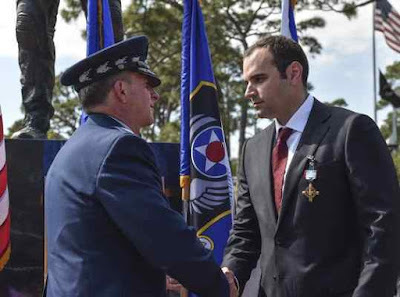 The Air Force Cross is so rarely given that Baradat’s medal is one of only nine awarded since the end of the Vietnam War.